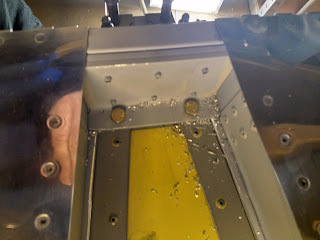 Drilled the holes for the bolts for the h-stab. Clamped it securely first, then drilled. 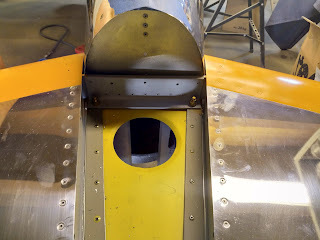 Had to trim off some of the fuselage skin to have space for the drill. For the aft bolts there was yet another bolt-rivet collision. 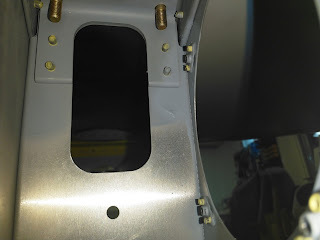 I had to remove 4 rivets and insert them the other way. The other way is the wrong way according to common practice (the shop head shall be on the thicker member, if possible). I have lost count on how many bolt-rivet, bolt-bolt and rivet-rivet collision there are in this kit. With pre-drilled holes, there really is no excuse for a single one!!! Well, cannot do anything but to move on.